The map is attributed to Jorge Reinel in 1520. 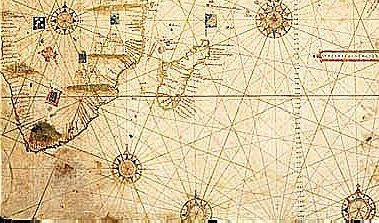 It is probably intended to refer to his map of the Indian Ocean, drawn about 1519 and published in the Lopo Homem atlas, otherwise known as the Miller Atlas, 1519, and preserved in the Bibliothèque Nationale in Paris. However, a comparison of the map on the stamp with the relevant portion of Reinel's map seems to show that this is not the case. 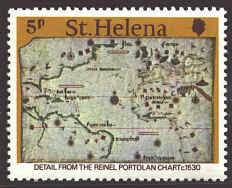 There are several designations that appear on the stamp on the map. At the bottom, PREMOTORIO ben espe is "Cape of Good Hope," which was reached in 1489. On the map of Africa MOTE LUNE, is "Mountains of the Moon," the hypothetical source of the Nile River. On the right side INDICVMM... is the "Indian Ocean." On the map of Madagascar, the name SALOVRM represents the Portuguese name for the island, "São Lourenço." None of these appear on Reinel's map. On the map of Africa there are also three representations of a Portuguese flag, indicating Portuguese claims to those territories. Similar flags do appear on Reinel's map. The map below shows the island of Madagascar with Mauritius to the east and colored red, from the map of 1519. 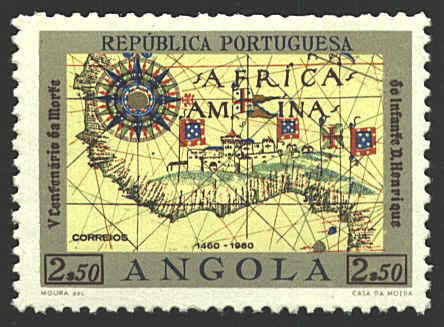 The Angolan stamp shows Elmina in Africa on Carta Antlantica by Jorge Reinel about 1540. 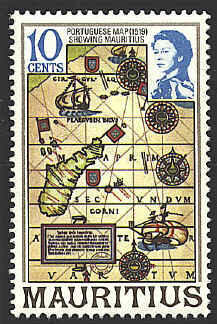 The stamp from St. Helena shows a portolan chart of the Atlantic with portions of North and South America on the west side. The chart was drawn in 1530 by one of the Reinels, probably Jorge.